WL recommended Steven Pinker's The Sense of Style. Pinker is a graceful and persuasive advocate for what he calls the classic style. To write clearly and expressively, as if showing a reader a view outside the window, or engaging a reader in a conversation of equals, one can do worse than consult this book. My one reservation is that the classic style is not the only style of value. Pinker admits as much, but he is a partisan. A Singapore news website requested a copy of my book STEEP TEA, and an email interview with me. They have now decided not to run the article because "this may not be the best time to publish an article about your book (it's elections period here)." The other reason given is that the article will not attract the kind of people who read the website. The explanation smacks of both self-censorship and dumbing-down. The journalist involved is not at fault; he has been helpful and professional throughout. I also find it hard to blame the website for caving in to political pressures to self-censor. Since the interview will not be used, I regard my answers as my own intellectual property, and so will publish them here. You will have to imagine the questions yourself, and view their absence as a sign of the censorship that Singaporean writers and artists endure. If you read my answers, you will see how innocuous they are, and therefore how afraid we are. Look what came in a blue starry bag in the mail. 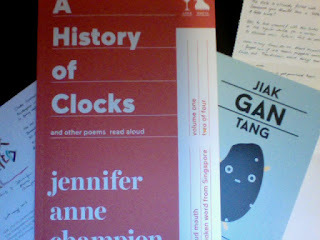 Jennifer Anne Champion's beautiful chapbook A History of Clocks, a postcard from Tel Aviv, another postcard titled "Jiak Gan Tang" for the Angmoh Singaporean, AND a poem written for me! First, to find the blank page. 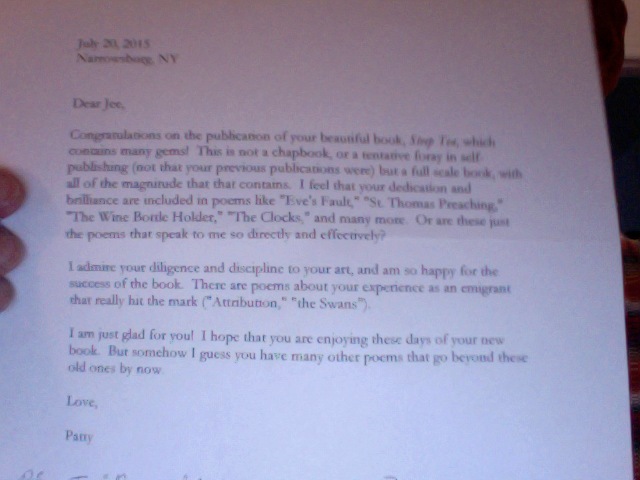 A lovely congratulatory note from my dear friend and colleague, Patty. It's so nice to get a real letter in the mail. She wrote from Narrowsburg, NY. Not the taste of paella marinera but the taste of anticipation. Anchovies. Beach that smells of cigarette ash. Men, like so many beaten up luxury boats, cruising in the lap of the Mediterranean. The water is so clear off Platja des Cavallet that I see the ghost of the fish that I ate last night. Eight years ago, you treaded the narrow walkway around the construction scaffolding inside the Sagrada Familia. Now the nave is polished to a shine, the light streaming through the stained glass windows as if through water. It’s all too bright and clean to you. When the church is finished in ten years’ time, it will be just another church, Gaudi dead as a saint in the basement. Guy visited Desperate Literature Bookshop, where I read from my book STEEP TEA. He took these photos. When you are in Madrid, be sure to visit this lovely bookshop and get a copy of STEEP TEA from Madrid! We're leaving for Barcelona tomorrow morning. So many palm trees, shooting up like fireworks. A courtyard of orange trees. After harvest, the sunflower stalks stand alert as otters. The Alhambra is a mosaic of not two, not three, but four dimensions. After moving through its fountains, gardens, and palaces, I see on the way home the tessellation of leaves and the space between leaves. I see the tessellation of leaves and the time between leaves. Riding pillion behind my host on a motorbike and slipping through the streets of Sevilla. In Murillo’s great painting, the child gives his coin to his mother, with a look of tenderness that only a child can give, just as the towering saint gives his money to the beggar man. Outside the cathedral, one night, the guitarist waved away the coin proffered by a child. He did not want charity but to sell his compact discs.